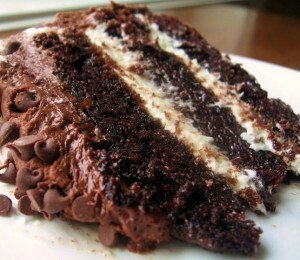 Layers of moist chiffon chocolate cake with vanilla butter cream filling and frosted with chocolate cream cheese icing. Here is an easy dessert recipes for Chocolate Cream Cake. Preheat oven to 350°F (175°C). Grease and lightly flour three 9 x 1 1/2, or 8 x 1 1/2-inch round baking pans. 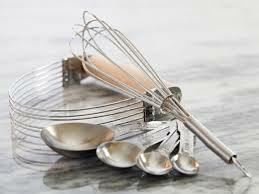 Using an electric mixer on medium to high speed, beat the butter in a large mixing bowl for 30 seconds. Add sugar and vanilla; beat until combined. Add eggs, one at a time, beating well after each addition. Beat in melted chocolate. Alternately add flour mixture and water, beating on low to medium speed after each addition just until combined. Pour batter into prepared pans. 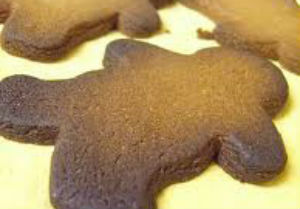 Bake for 25 to 30 minutes or until a wooden pick inserted near the centers comes out clean. Cool in pans on wire racks for 10 minutes. Remove from pans. Cool completely on wire racks. To make the butter cream filling, beat butter, powdered sugar, milk and vanilla together, adding additional milk, if necessary, to achieve spreading consistency. 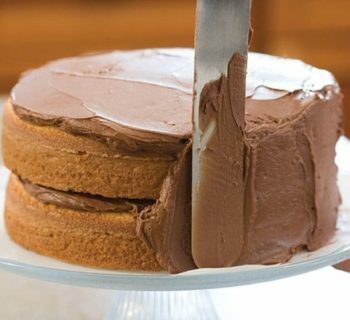 For chocolate cream cheese frosting, beat cream cheese and milk together until combined. Add in powdered sugar and mix until incorporated. Beat in melted chocolate and vanilla. Add in additional milk, if necessary, to achieve spreading consistency. To assemble, spread butter cream filling on two of the layers; stack layers. Top remaining layer. Frost the cake with chocolate cream cheese frosting. Sprinkle top with mini chocolate chips, if desired.